There is a really good article about the run across Australia in today's Journal. It's mainly a piece catching up on things since the run across the USA and a reminder that the next big run is just 123 days away! 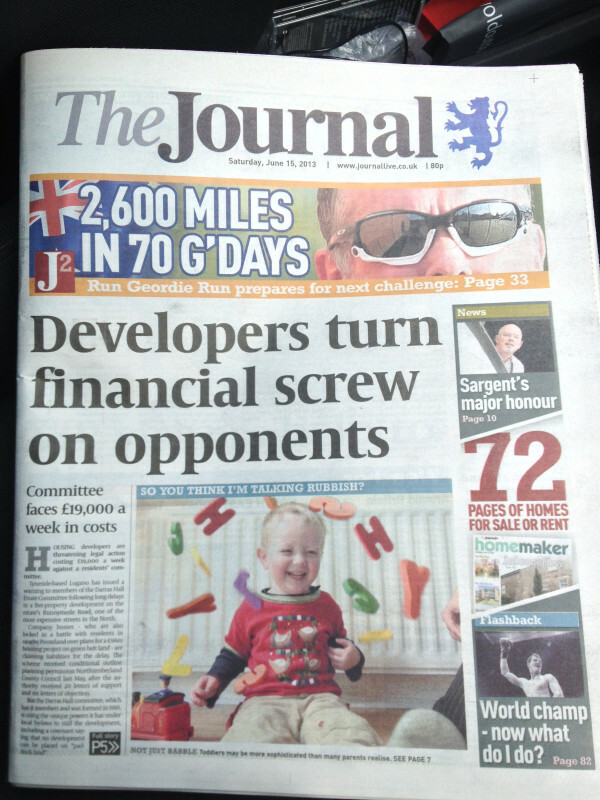 The front page below has me proudly showing off the custom made Oakley sunglasses that were kindly donated by The Big Optician in Byker. The article inside spans 3 pages with some really nice photos of me running and a one with my mentor David Fairlamb. I've always enjoyed excellent coverage in The Journal. In fact, I think this is the 5th time that I've appeared on the front page with countless other articles about my running over the years. They have once again pledged their support, so please look out for more coverage in The Journal, not only up to but during the run across Australia. Finally, is it wrong that I'm proud of the fact the The Journal described me as a Bacon Sandwich Fan? My intended route plan for the run across Australia has been in place for well over a year now. Despite that, it has been checked and double checked on numerous occasions for accuracy, error, obstacle and diversion. I've spent many hours doing this and I'm happy to report that I don't intend to repeat this painstaking task again. The current route plan is therefore considered to be the final one. The image below shows the route starting at Perth and finishing in Sydney. The total distance is 2558 miles. During the 70 days that it will take me to run across the country there will be 61 days where I run 41 miles, 1 day of 35 miles, 1 day of 22 miles, 6 rest days and 1 "contingency day". There was always room for a mileage deficit during the run across the USA. That said, I did have to run an average of 40 miles per day during the latter stages. Regular readers will also remember that I had to run 60 miles on day 100 to reach the finish line at Coney Island on time. That wasn't ideal when I had already ran 3040 miles! The effect of a such mileage deficit in Australia would not only reduce the chances of getting to Sydney on time, it would also make the support team's job very difficult indeed. To allow a swift changeover of support team members the "tour" needs to be in pre-determined places at pre-determined times. Any shortfall in the mileage and we could see incoming and outgoing support team members stranded with no easy way of joining/leaving the tour. December 24th (Day 70) - Finish in Sydney. The rest days are going to act as an incentive to keep the mileage deficit to a minimum. I need to get my mind thinking that if I can get to the end of each day in mileage "credit" then the reward, which is never too far away, is a whole day off running. This will give me a chance to rest briefly, recover and write a detailed blog which is always time consuming. If I aim to run the 41 miles per day and fall short then we are talking damage limitation and hopefully a mileage deficit that doesn't put too much of a dent in the chance of successfully running across Australia. 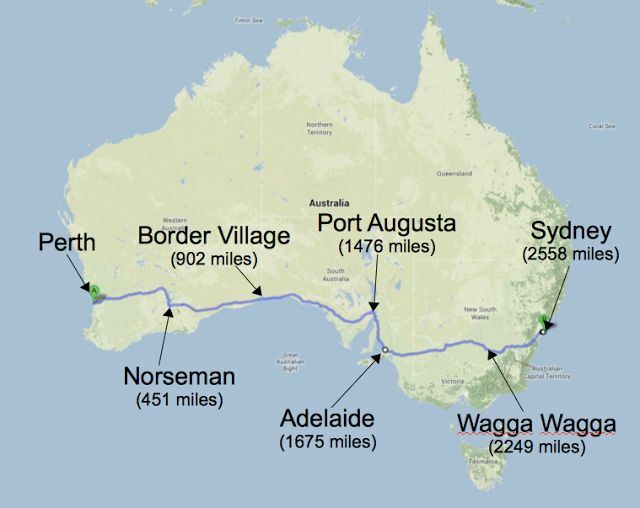 If I fall way short of the 41 miles per day then the run across Australia could be over before it has even begun. There were times in the USA when I only managed 20 miles per day. If that happens just once or twice in Australia then I could find myself with a mileage deficit that could be impossible to reduce. I know from the experience of the run across the USA that the effect that this scenario would have on my mental well being. I'm talking about a high state of anxiety and the kind of panic attacks that plagued me during the final 5 days of the run across the USA. I'm sure you will agree that there will be very little room for error on the run across Australia. Be under no illusion that this is not some kind of novelty fun run. It is going to be 70 days of pure endurance running where both my mind and body will suffer extreme stress and be exposed to many risks. I haven't even touched on the dangers and risks that the support team and I will face on a daily basis in Australia. That's for another blog post. There is a far greater chance of failure on this run than the USA. It is going to take an unprecedented amount of stamina and good luck to make it to Bondi Beach on time. I promised The Sir Bobby Robson Foundation and The Children's Foundation that I will give the run across Australia my best shot. If I succeed and raise the target of £50,000 for the 2 charities it will be the greatest achievement of my life so far. There are only125 days left until I set off from Cottesloe Beach in Perth. To say that I'm fully focussed on doing my best and making this run a success is an understatement!